- Discover Popular, Now Playing and Top Rated movies. - Get detailed information about Movies, Cast and Crew. - Find similar movies and movies related to a certain actor. - Watch movie trailers inline. - Share using Twitter, Facebook, Mail or Messages. - Print, Save to Camera Roll and Copy supported. - Free text search TMDb for Movies and Persons. - Handle your TMDb Favorites and Watchlist from within the app. - Rate movies when logged in to TMDb. - Fully supports the TMDb 3.0 API. - Get an account at themoviedb.org or from within the app. It's free. - Support for iPhone 5. What about the name, Cineast? A filmmaker or an enthusiast or devotee of movies or filmmaking. Cineast is currently available in English, Swedish. If you would like to localize Cineast please send us a mail at [email protected] and we will send you the needed files. It’s really easy. You only need a text editor to do the work. If you have any questions, problems or anything else you would like to share, please contact us at [email protected]. Great app - This is a great app! Fast and with great quality trailers. A rising star! - You might ask yourself why should I buy this app, when I can have similar apps for free? But there is a very good reason for that - this app features a favorite function! Great movie app! 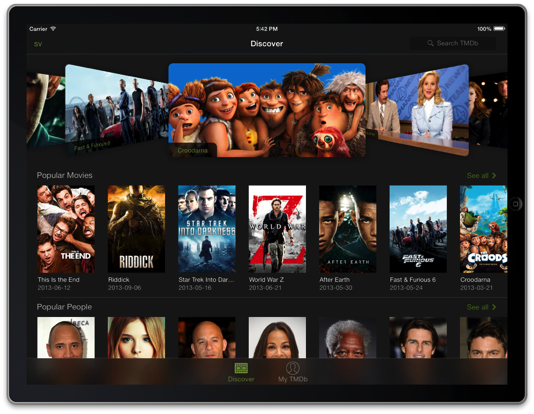 - I couldn't find a great movie app like this!! Maybe add directors, but this app is fantastic!!! Great choice of movie website, too!!! What I was looking for - If you want more than just the trailer, this is the app for you. While there is not information for every movie ever, you will get release dates, and run time, often the trailer or poster of the movie release and a list of cast and many of the crew. Good information for movie afficionados. © 2000-2019 Bitfield AB. All rights reserved.